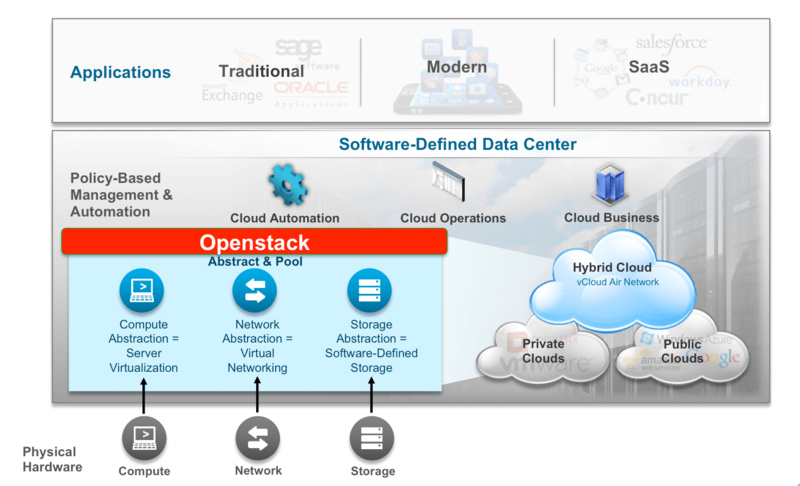 Openstack is the leading open-source platform for deploying virtual machines in data centers. It allows IT infrastructure teams to deploy virtual machines and other IT infrastructure components. Either through the service portal or through the API that comes with Openstack. The discussion that I have with most customers around Openstack if fact that they think the functionality of Openstack and VMware vRealize Automation (vRA) is the same. In fact customers are right. We do offer the same functionality that Openstack has to offer, but vRA is much more than an Infrastructure-as-a-Service (IaaS) platform. To define the positioning I have plotted Openstack in the VMware SDDC solution offering below. vRA (Cloud Automation) in its core is a self-service portal that can deploy virtual machines. It consumes the resources that are provided to it from the compute, network and storage layer in order to create virtual machines that can host applications. This is the same functionality that Openstack offers. However vRA and the rest of the vRealize suite can do a lot more then provision infrastructure resources. Providing IaaS is just the first step of automation. The end goal is to provide full management capabilities to manage and monitor all the data center resources in order to provide virtual machines and application resources. Integration of all the IT management components is crucial for the creation of a Software Defined Data Center. And that’s where the big difference is: Openstack in its essence is an IaaS tool, vRealize Automation is a automation & orchestration engine to create a SDDC (and also includes IaaS). SDDC is not a VMware-only stack. SDDC is a term for the automation, orchestration and integration of all IT components in the data center. It needs to work with all the IT solutions you already have inside your data center. So it could well be that you have a VMware estate next to an Openstack estate, to service different workloads within your datacenter. Whatever flavour of Openstack is the choice of the customer. VMware vRA can connect via the Openstack APIs to manage the resources in the Openstack layer. VMware also offers an Openstack flavour: VMware Integrated Openstack (VIO). This is a distribution for those companies that want an enterprise-grade version of Openstack. A predefined installation of Openstack is supported and maintained by VMware. So the conclusion is that Openstack can be one of the building blocks within the SDDC to host the application workloads in your datacenter. It fully integrates and the result is the best of both world.